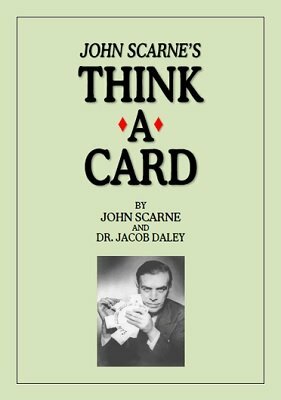 From noted card man and gaming expert John Scarne comes this clean-cut triple prediction miracle effect that will build a reputation for you. No difficult sleights. Simple, sure and direct. The publisher had been after Scarne for years to release this clever item, before he finally agreed. Any deck of cards is shuffled by anyone and spread out on the table face up. Two spectators and the performer each merely think of a card and you write a prediction on small slips of paper for each card thought of. The thought-of cards are pushed out of the pack and the predictions are placed on top of each card. Any spectator opens the billets and all three cards have been positively and correctly predicted. A bombshell in modern magic. No thumb writers, pocket writing, etc. Worked surrounded by spectators and dead easy to work. All you require is the instructions, as no gimmicks are used. Use anyone's cards and anyone's paper and pencil. 1st edition 1938, PDF 14 pages.